Please join us this Wednesday, July 11, at 5:30 ET for a conference call on immigration with Senator Jeff Merkley (D-OR) and Dr. Phil Wolgin, managing director of immigration policy at the Center for American Progress. To join the call, please RSVP here, and please send your questions in advance to [email protected]. The call will be off-the-record. 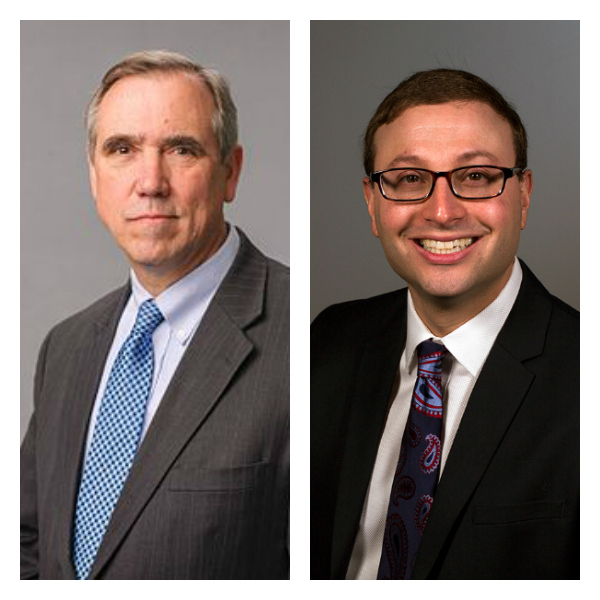 JDCA agrees and has joined Sen. Merkley in condemning the Trump administration’s unconscionable and inhumane “zero-tolerace” policy of separating families at the border. We are honored to have such a clear, outspoken champion on these important issues join us on this call, which will also provide an opportunity to ask about the Supreme Court nomination pending before the Senate. In addition, we will be joined by Dr. Phil Wolgin, a renowned immigration expert who directs the Center for American Progress’ research and publications on immigration and has led initiatives on a diverse set of issues, such as immigration reform, child refugees at the southern border, and border security. You can sign up for the call here, and please feel free to forward this information to others who may be interested. The only requirement for joining the call is an RSVP. If you would like to ask a question, please send it ahead of time to [email protected]. Koach Frazier is arrested as Stosh Cotler and Rabbi Jonah Pesner continue to sing. Photo: Bend the Arc Facebook. This summer, the general meeting of the Havertown-Area Community Action Network (H-CAN) will focus on immigration issues. The main speaker at the meeting will be Cathryn Miller-Wilson, executive director of HIAS. Miller-Wilson will discuss local, national and international immigration issues, as well as how current legislation is impacting immigrants and what we can do to help. If time permits, there will also be a brief training session for immigrants and activists. The meeting is open to the public. For more information, contact Madeleine Shusterman. Last Thursday, at a vigil for detained immigrant Jonatan Palacios, speakers addressed a crowd of about 275 protesters at the Haverford Train Station. Residents of Haverford and beyond applauded speakers at the vigil. On the morning of May 11, Jonatan Palacios was arrested by ICE agents in front of his Haverford apartment. Originally from Honduras, one of the most violent and dangerous countries in the Western Hemisphere, Jonatan came to the U.S. as an unaccompanied minor when he was 16 years old. He is a valued member of the community, a loving husband, and a straight-A student at Delaware Community College who was ripped from his family and life months after he had begun the process of becoming a legal citizen in the United States. Please join us to show solidarity, support, and prayer for Jonaton and his wife, Lillie, who was with him when he was taken away. This type of senseless targeting of innocent people is happening in communities like ours across the country. Help us send a message that it will not be tolerated in our community. NOTE: Please meet at the Sharpe Park and Bird Sanctuary at 405 Montgomery Ave, Haverford, PA 19041; vigil will start at 5:15 across the street at the SEPTA Parking Lot on Cheswold Rd in Haverford. Please wear blue, Jonaton’s favorite color, and bring signs with messages of support. All are welcome. Dreams and Nightmares / Sueños y Pesadillas is a memoir by teenager Liliana Velásquez, who at fourteen years old fled horrific violence and poverty in Guatemala and headed out alone for the United States. On her trip through Mexico she was robbed by narcos, rode the boxcars of La Bestia, and organized thirty of her fellow Central American bus passengers to convince the Federales who had arrested them to allow them to continue on their way. Finally, she made it to the US border, and headed out across the Sonoran Desert, where she encountered death and was caught by US Immigration. After four months in a detention center, she was placed in foster care while the courts decided whether to deport her. She spent a year in a horrendous foster situation and eventually landed on her feet with a family that loves and protects her. After having to recount her story of abuse several times, the judge determined it was too dangerous for her to return home and finally granted her a green card. She is now in high school, while she works to support her family back home and makes plans to go on to nursing school. Editor’s Note – Events are moving quickly. This initial story will be expanded on over time. At Philadelphia International Airport and locations throughout the U.S., on Saturday and Sunday thousands of protestors demonstrated against President Trump’s ban on immigrants. There were frequent developments in Washington and the rest of the country as well. Tuesday, 8 pm: Trump scheduled to announce his pick for the Supreme Court. This justice could be the crucial vote that decides the legality of Trump’s immigration ban. Tuesday, Morning/Afternoon: Senate Democrats spoke at length about former Acting Attorney General Sally Yate’s courage in defying Trump. The Republican majority allowed them to speak, even though it delayed the vote to confirm Jeff Sessions as the new Attorney General. That vote is expected to take place on Wednesday, February 1. Monday, Late evening: Yates is replaced by Dana Boente, who immediately reversed her directive. Meanwhile, Yates is still packing up her office after a 27 year career with the Justice Department. These are the words written on the base of the Statute of Liberty. These are the values that make America great. And today, these are the values that are threatened by Donald Trump’s executive order banning immigration from seven blacklisted countries. We must respond — and we will start today with a rally in Battery Park, New York, and a vigil at the Statue of Liberty. Bring children; bring beautiful signs; bring musical instruments and snacks. The forecast is 45 ° and sunny, and this is a fantastic way to learn about American history and to take civic action. This issue is not about Republicans or Democrats — it is about the soul of America. Trump’s executive action will not make Americans any safer. We all share real concerns about terrorism. That’s why our nation has rigorous screening procedures in place for all refugees. An American has never been killed in a terror attack on American soil by a person from one of the seven countries that were blacklisted today — and never by a Syrian refugee. Meanwhile, the countries from which the terrorists of 9/11 (Saudi Arabia, Egypt, UAE and Lebanon) came from were excluded from the ban. We must stand up against this un-American absurdity! For more information, email Rabbi Ari Hart, co-founder of Uri L’Tzedek: Orthodox Social Justice, or call him at 434-294-9414.